When it comes to meal time, sometimes it's hard to please everyone! The other day I made some pretty awesome quiches with a homemade almond flour crust. However, I was the only one that actually thought having the crust was cool. They looked beautiful, but when it came down to it, the crust wasn't necessary, just extra food that I didn't need, and my kids only liked the inside. I think I'll save the crust taste for a personal pie that I'll make sometime. 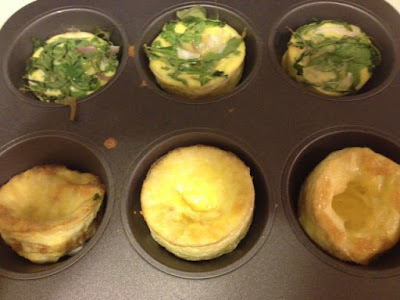 These muffin tins are the perfect solution if you want to make an egg omelette or egg dish for a group of people who all have different tastes. Each muffin tin can be personalized so you CAN please everyone! One of these were filled with onions, arugula, and cheese. Another just plain cheese. One pepper, mushrooms, and spinach. It's an easy way to please a family! They turned out awesome as well! I used: Red Onions, Sauted Mushrooms, Fresh Arugula, and Fresh Spinach. Use any meats or any veggie your little heart desired. Get as creative as you like. I used a few sliced of Grass Fed Chedder cheese. 1-2 tsp per egg tin. Directions: Take 1 tsp of Coconut Oil and with your finger tips grease each muffin tin very well. Pre heat the oven to 350. Whisk all the eggs together in a large bowl. Add Himalayan Pink Salt. 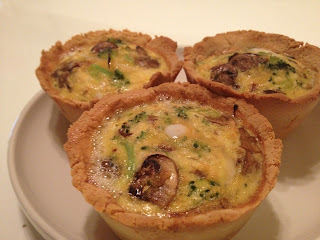 Pour egg mixture in to each over sized muffin tin about 2/3 full leaving room for the veggies and cheese you plan on adding. 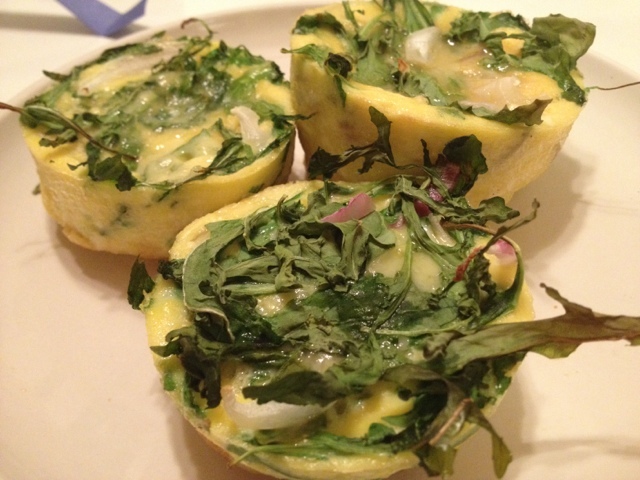 Drop the veggies in each muffin tin and sprinkle cheese over it to your personal preference. You may want to stir the veggies in a little so they aren't just cooked on top as well as the cheese. Put it in the oven and bake between 15-20 minutes. If you have regular size muffin tins you can use these as well. They won't need to cook as long and you will make many more. Let them cool and they should come right out if you used coconut oil. Cut them up in to little pieces for your little ones since they are very hot in the center. ENJOY!! Like P90X? Become a coach today ... http://www.beachbodycoach.com/mdool145 . Earn extra income while helping people become happy with their health, fitness, and nutrition! Yum, these look so good. I am going to have to try them this week. How long can you store them in the refrigerator? Do they keep for a couple days? Lindsay, Thank you! I believe they stay for about 3 days. Eloise, Yes I agree! That sounds awesome! !